By tapping into the top teen zone trends, your library can become a hot spot for teenagers. Here are the trends that I’ve been reading about and seeing in libraries and schools across the U.S.
Inventing deepens teens’ understanding. According to The Digital Shift, makerspaces and making activities promote learning through play. They also demystify science, technology, engineering and math, and encourage individuals, especially women and minorities, to pursue careers in these fields. In short, hands-on activities encourage teens to tinker, create and learn. You don’t have to have a lot of space, tools or equipment to foster a making environment. A “makerspace” can work on any budget and it may not even be a set physical space (See Makerspaces on the Move). What does your furniture say about your teen space? A relaxed environment encourages teens to be themselves. Comfortable, yet durable furniture has informal appeal that’s great for hanging out. Color creates an attractive, welcoming vibe. You may also consider bold color choices, which have an edginess that appeals to teens. With lightweight, moveable furniture, any space can be easily reconfigured for different activities, moods or group activities. For example, flip and nest tables and chairs enable easy set-up and tear-down and accommodate various programs. So if your teen zone doesn’t necessarily have a permanent home, this furniture helps a teen zone work anywhere. Up-to-date, happening decor sets the tone and makes teens want to stick around. One of the best ways to define a teen space is to listen to teens. Ask teens for their ideas to shape the teen space and perhaps even name it. 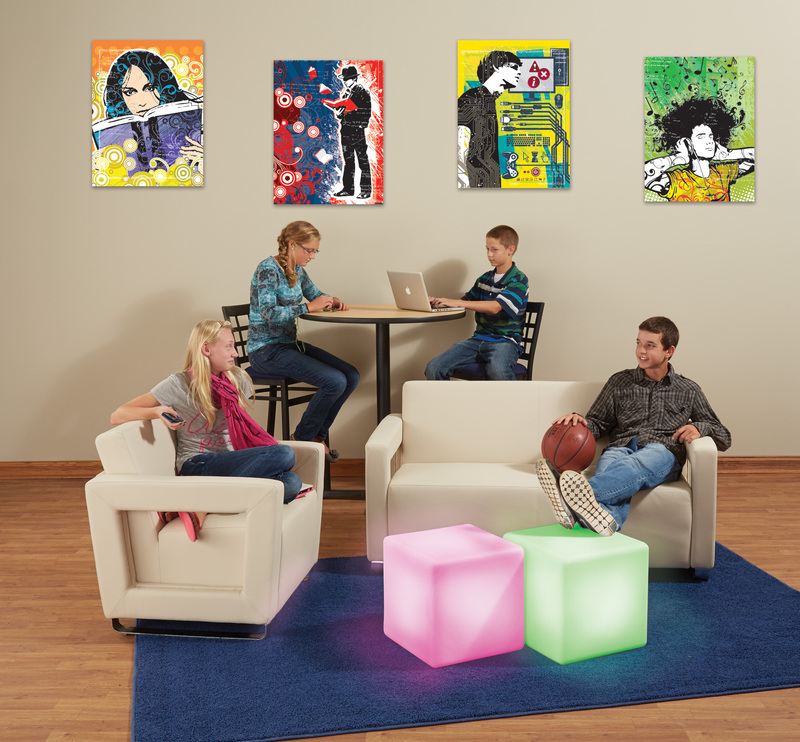 You can also have teens choose what art to display. Consider reserving some walls for teens to display their own projects. From smartphones to tablets and social media, teens like their tech. The recent “Teens, Social Media & Technology Overview 2015” stated 56% of teens ages 13–17 go online several times a day, 75% of teens have or have access to a smartphone and 94% of teens with mobile devices go online daily. Having technology and power access in your teen zone is a draw for teens. They encourage teens to stay and hang out. Fortunately, much of today’s furniture, including tables and lounge seating, features built-in power outlets so that patrons can plug in devices (See Charge It Up! Charging Stations & Other Power Trends). According to Demco Interiors, the biggest thing to remember when using furniture with electrical outlets is that you need to plan for a power source in your space layout. This means being strategic about powered seating placement. If electrical access in the right places is problematic and layout reconfiguration isn’t possible, there are also freestanding charging stations and electronic lockers that may be a better fit for your teen zone. I’m excited that teen zones are becoming more and more inspiring and that products, furniture and programming are keeping pace with today’s teens. Libraries have a wonderful opportunity to help teens express themselves, learn and discover what’s next. Browse our idea gallery to see fresh ideas for teen spaces! Rosalie is a former Product Manager at Demco, where she kept close tabs on what was happening with young adult library services to inform Demco’s selection of furniture, displays, décor and learning materials for teens, librarians and educators.